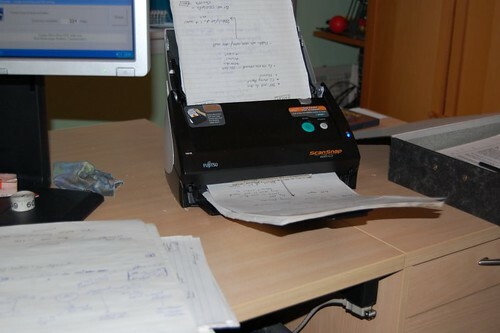 Favourite purchase of 2007: A Fujitsu ScanSnap S510 scanner with auto-document feed. It's not a cheap scanner, but I've been drowning recently under a sea of paperwork and clipped articles, and it sounded pretty neat: scanning both sides of A4 and quickly. The scanner comes with a ton of Windows software: a driver, some OCR stuff, a full version of Acrobat, business card scanner, organisers, and a gadzillion menu entries for all those things. But it is pretty amazing to watch as you feed in a few hundred pages of A4 and within minutes you have a fully-searchable PDF file out. So in two days I've scanned just under 2000 pages; some of it into nice fully-searchable PDF files, and some (the stuff I know I want to be able to see in 10+ years time) in jpeg. I've now got an overheated shredder and little shredded bits of paper everywhere. Although the scanner doesn't work out-of-the-box with current Linux distributions, it just needs a single line adding to a configuration file and then works perfectly with Red Hat Enterprise Linux (I tried RHEL 5 Client as well as Fedora 7). I've sent it to the maintainer so hopefully future updates to Sane will be able to handle the scanner without any editing. 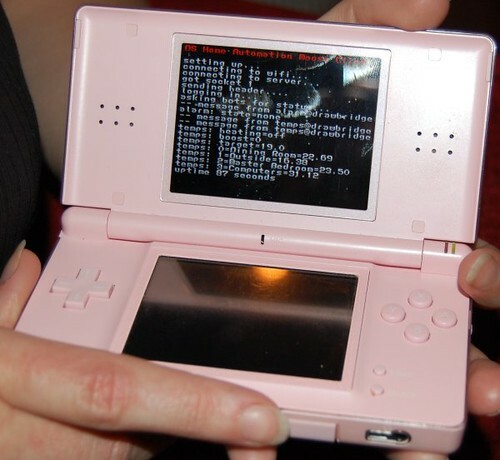 Last month I read a blog entry from hadess via Fedora Planet about hardware to let you run homebrew applications on Nintendo DS. There is a ton of homebrew applications available, but as of yet no jabber client. My home automation system is all based around XMPP, with a standard Jabber server to which all the home automation systems connect to share messages. I wrote it like this so that it would be easy to just take some existing Jabber client for a platform and be able to come up with a nice looking front end with minimal effort. I found Iksemel, a portable C XML parser and protocol library that looked perfect, and it only took a couple of hours to have it ported on the NDS, and a couple more hours to get it working with PAlib for wifi. It's not a generic Jabber chat client, but it wouldn't take too much work to make it into one (although I didn't bother with encryption support so you won't be able to use it with Google talk servers for example). Anyway, the code might save someone a few hours, so I've made the source available.